Amid the American interpretation of a beautiful garden scene in Tokio in the land of flowers, with Geisha girls and pagodas all about, Manager Miles opened the sixteenth Chicago Automobile Show yesterday with a wave of the hand to the bandmaster, who, in turn, raised his baton—and the biggest and costliest motor car exhibition was a fact. It had been ready for hours to swallow a surging mass of humanity; there was none of the old-time rush to have exhibits ready— everything was completed long before the hour set for the doors to open, for the buildings had been in the hands of the artists and decorators a week ahead of the usual time. Then immediately the visitors lost themselves in the maze of beautiful cars and talked and bought cars. It is not to judge of the extent of business from the opening day, but if there have never been first-day buyers, the show of 1916 is an exception—there were buyers, from home and out of town; wholesale and retail buyers. “Better cars this year, but, above all, more cars and more cars,” seemed to be the Western slogan. That prosperity reigns throughout the United States is a fact now commonplace, but the demonstration of national wealth given yesterday at the show was spectacular enough to elicit surprise from men in closest touch with the financial pulse of the country. 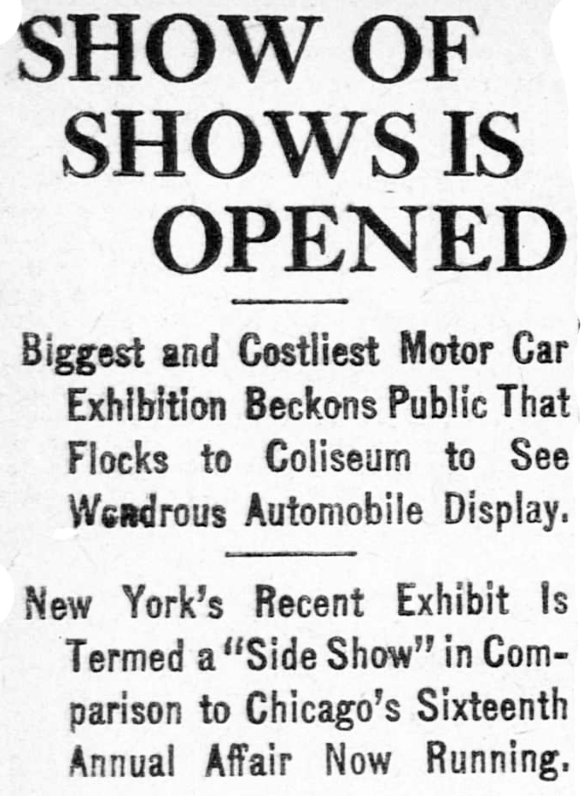 New York’s recent automobile show under the same auspices was termed a side show by visitors to both exhibitions, after a single tour through the four display structures—the Coliseum, Coliseum Annex, Greer Building and First Regiment Armory. There were surprises and points of fascinating interest at nearly every step. Here was $3,000,000 of the latest in everything pertaining to America’s fastest growing industry. Here were 1916 cars ranging in price from $395 to $7,200, revealing marvels of mechanical progress and advances in luxury and refinement, even in the lowest priced models. Here were eight-cylinder and twelve-cyilnder types aplenty whereas only a year ago the eight was a sensation. Here was an abundance of splendid fours and sixes, examples of miraculous engineering development. Here, indeed, were cars for every man and woman, for every taste and requirement, with the presumption accepted by every maker that the average man’s taste demands maximum value, whatever price he wants to pay, greatest motor dependability, economy, structural sturdiness, artistic appearance, luxury and simplicity of operation. To-day the great automobile show itself remains closed, but social and business less activity inspired by the annual event will keep humming throughout Chicago’s loop district, at every hotel and at the leading clubs. New regiments of dealers and men of every branch of the automobile industry and its affiliations will arrive in the city to-day, with further reinforcements booked from the North, East, West and South to-morrow and Tuesday. About 4,000 dealers are gathering in Chicago, prepared to invest in greater stocks of cars than ever before. Altogether the buying brigade of wholesale and retail purchasers drawn from every section of the country numbers about 15,000. The exhibitors’ visiting forces, including officials, engineers, salesmen and high-grade mechanics, announced to at least 3,500 more. Altogether the out-of-town attendance score made by the show wlll pass the 50,000 mark. This year access to the show is gained by one of three entrances instead of two in the past. In addition to the Coliseum and armory portals, an entrance haa been erected at the Greer Building in Wabash avenue. Although a box office will be maintained here, the bulk of those passing through will be exhibitors and aides. As usual the Coliseum and armory are connected by a sheltered passageway. One variant from the usual program is found in the fact that society night next Wednesday evening will be conducted without an increase in the entrance fee. 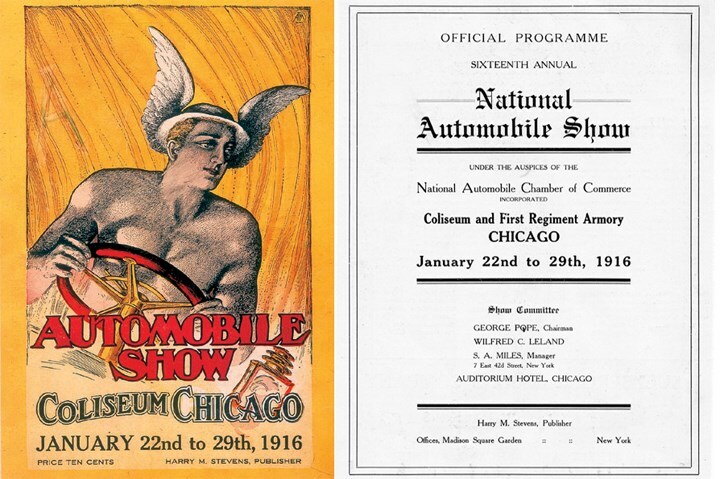 One admission price for all will be maintained throughout tho exhibitions Wednesday at the First Regiment Armory the annual meeting of the National Automobile Chamber of Commerce, under the auspices of which the big show is conducted, will take place. Colonel George Pope is chairman of the show committee, and is aided by W. C. Leland and Manager Miles. Nothing from the artistic viewpoint has even approached in impressive beauty the decorative scheme which prevails in every building. A park in Toklo has been reproduced by Artist Tietzel. Monumental gates, quaint towers, pagodas and other lovely examples of Japanese art have been reproduced in a way that calls the approbation of artiats of Nippon. The walls are framed with cherry trees, a splendid blue sky effect utilizing nearly 90,000 feet of canvas has been installed and altogether a “cherry blossom” atmosphere has been conveyed to enhance attractiveness of the world’s greatest automobile show. This is the sixteenth show held in the Coliseum. S. A. Miles has managed every one and has had L. L. Pest as assistant manager. In the Keith Building, in Wabash avenue, N. H. Van Sicklen conducted a bicycle show in 1898, and there were two or three electric cars exhibited. The first show, in March, 1901, had eleven exhibitors, and Haynes, Apperson, Woods electric and National were the only exhibits at that show. What would have been the show of January, 1908, was held in the late Fall before, in 1907, but Fall shows did not prove satisfactory. 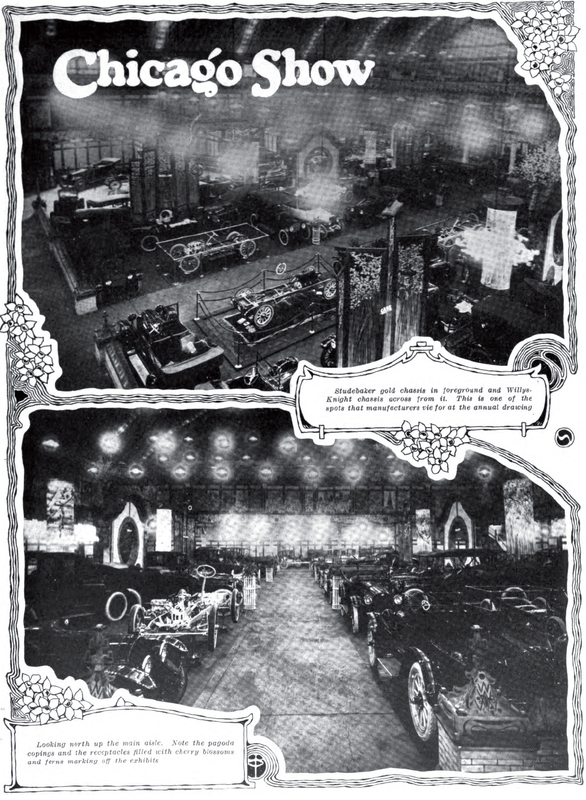 The first show had a track inside the building, on which demonstrations were made; the second show, in 1902, had too many exhibitors to afford space for a track. A spectacular feature of the all-Amerlcan invasion of Chicago during Automobile week ls the visit of a Texas Steer delegation of 150 Texas automobile dealers, who arrived Saturday on a special train. The trip was arranged by Louis J. Wortham, A. L. Shuman and others of Fort Worth. One sensational exhibit from the purely picturesque standpoint is a car of gold, its body being valued at $25,000. “Some figures concerning the gigantic progress of the automobile industry in 1915 are of interest at this time,” said Manager Miles. The production of pleasure vehicles and trucks last year reached the 850,000 mark. Their retail value has been placed at $691,778,000. The horsepower of all automobiles in use in the United States, 51,000,000, exceeded that of all steam locomotives in the United States, 48,000,000. Automobile registration in the United States passed the 2,070,000 mark and in New York State alone 231,713 cars are registered and taxed. This means that one family in every ten has a car. “It was a year in which extraordinary dividends were declared by many automobile makers, a year of ‘prosperity-plus’ in every branch of the industry. What this year will bring forth we do not venture to predict, but remarkable growth may be counted upon, as a year ago the National Automobile Show took place at the ‘turningpoint’ toward great prosperity all over the country after months of deepening money stringency and depression. Automobile history, ao far as this country ia concerned, would not be complete without a considerable amount of apace being devoted to the part which Chicago and Chicagoans played in it. It -was in Chicago the first road race was held, on Thanksgiving day, 1905, when Charles E. Duryea won against a field of half a dozen starters, in the wonderful Ine of something like eight miles hour. It waa at the old Washington Park race track that the first track race waa held, when James Levy, president of the Chalmers Motor Company of Illinois, was one of the Ralph De Palmaa of the day and when tho writer acted as starter. And lt was at the World’s Fair of 1893 that motor vehicles, practically all electrics, were first exhibited. History ls a peculiar thing, in that lt has its gladness and its sadness, its successes and its failures; and the history of the automobile business in Chicago is just history—with its successes and its failures. Perhaps if all the years were taken into consideration the failures would exceed the euccesses, but it is successes in which the public is interested—it were best the failures be forgotten. To-day Chicago may boast a very large number of men who have pioneered in the motor field and who have automatically been thrown into tho aide of success. But it was not without its griefs, its hardships, its battles, its sticktuitiveness— and, when all these obstacles have been overcome, who will deny that a man ls entitled to a reward of money and credit for having headed off failure. DEAN IS HARD TO PICK. It la a delicate proposition to make a decision as to whom is entitled the credit of being the dean of Chicago automobile dealers. There would be, naturally, a little difference of opinion of dates and facts. Memory is strong in some directions, weak in others. 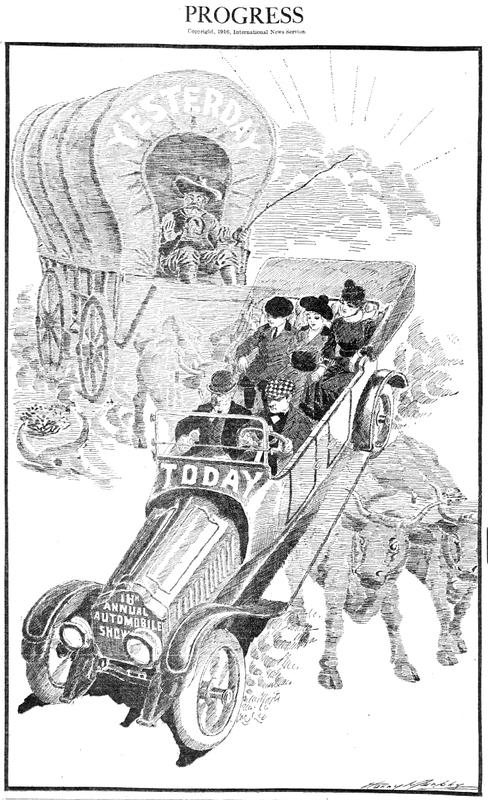 There were many who were early birds but who did not catch the worm, but there are a few who to-day are still in the business and who were at least among the very first to see the possibilities of the automobile, or horseless carriage, as it was then called. Along in 1899 and 1900 there were motor-driven tricycles and these were the forerunners of the present day motor car. Some of the men who to-day are handling modern cars sold these tricycles, and keeping pace with the industry, grew along with it. Such was Ralph Temple’s and James Levy’s beginning. Walter Githens, head of the Maxwell Auto Sales Company, dates back to May 1, 1899, when he took charge of tho Electric Vehicle Company on Michigan avenue, north of Jackson street. The Illinois Electric Vehicle Company ran electric cabs and Githens ran this until April. 1900, for itvwas a part of the “E. V.” Company. He switched to the American Bicycle Company (which was dabbling in motor-driven vehicles), but on November 1, 1901, he and his brother, H. A., formed the Glthens Bros.’ Company, which only a few months ago was succeeded by the Maxwell Auto Sales Company. The Waverly electric, Toledo steamer (afterward the Pope-Toledo) and Rambler “hydro-carbon” cars, formed the line until October, 1902, when the concern took on the curved dash, one-lung Oldsmobile. The other cars were dropped and only the Olds carried, until 1908. But in 1903 Githens had the two-cylinder Searchmont, made in New Jersey, after French design. In 1907 he also had the Stearns, with the Olds, which had made progress. Then in the Fall of 1908 Githens took the E-M-F., was interested in the factory, and kept the agency until 1909. This is now a part of the Maxwell Company and it brought Githens handsome returns for his stock. So, it will be seen the Githens will soon have seen seventeen years in the Chicago automobile business. Ralph Temple, still in business as agent for the Jackson, Empire and Waverly lines, believes he is just a little ahead of Githens. So far as “horseless vehicles” are concerned Temple was an agent as far back as 1899, when he handled a French tricycle and also the Thomas motor tricycle. He had a bicycle store on Lake street then but the next year moved to 291 (old number) Wabash formerly occupied by the Pope Manufacturing Company, of which Bob Garden—Mary’s father, and the Pierce-Arrow agent in New York now— was manager. Here Temple had the National and Woods electric cars and a year later took on the curved dash Oldsmobile. Of late years his lines have been those he now carries, and the National, Olds and Woods are still in the field. 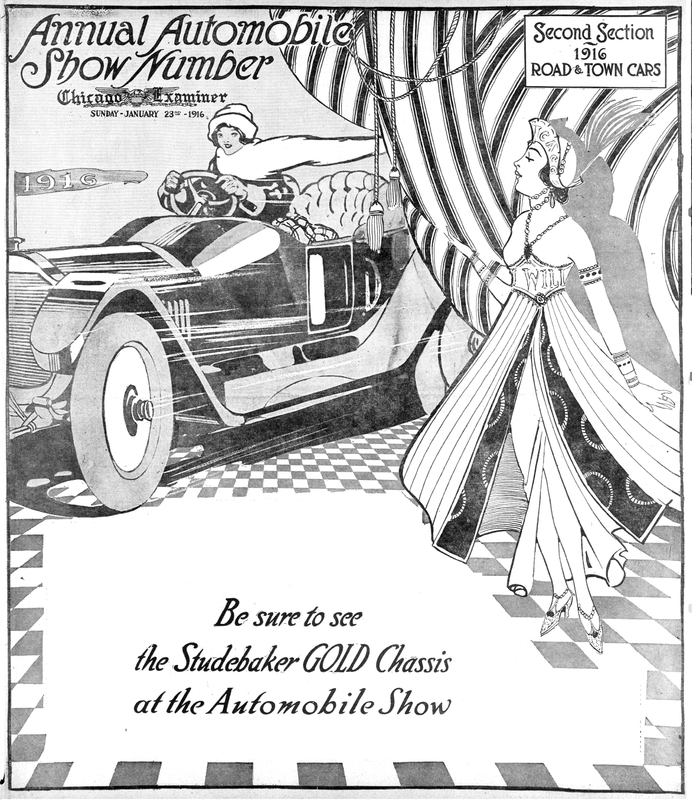 Because he has been indefatigable, because he is just as much a sales- man to-day as a president, are the reasons for the success of James Levy, president of the Chalmers Motor Company of Illinois, who began his automobile life in 1900. Of all the automobiles he has sold— well, he has a lot to answer for to some of his customers of the period around 1900 and 1901; of late years he has been able to redeem himself. It was while in the employ of A. G. Spalding & Bro. that Levy began his gasoline existence. The Cleveland tricycle and the Knox three-wheeler were the things that gave him his first reputation. That was in 1900. Then he was with the Electric Vehicle Company, later secretary of the Githens Bros.’ Company, which handled the little curved dash Oldsmobile. He jumped to the Mead Cycle Company and got rid of the German Benz, the Murray, the Marr and the Hoffman Branching out for himself, he and Louis Geyler formed a partnership in 1904, and took on the Autocar and located on Wabash avenue. In 1907 they had the Thomas-Detroit (now the Chalmers) and in 1910 the Hudson. Before that, in 1907, he and Geyler dissolved partnership. Levy keeping the Thomas and Geyler taking the Stevens-Duryea. When the Hudson came out Levy had it, and in 1910 dropped it, keeping only the Chalmers, which he still has and from which he has made a comfortable fortune. For a time, however,he handled the Lozier. The Wlnton interests have been represented in Chicago for more than sixteen years. In 1900 the first branch was established in a grocery store at Fourteenth street and Michigan avenue, with Charles Tucker as manager. As a matter of fact a man named Mack— really the first Chicago automobile dealer— had the agency on Wabash avenue before that time, and he also had a foreign car, when the French De Dion was represented in a livery stable on Michigan avenue. Every since the Winton Company has been here, for years occupying a big building built for it at Thirteenth street and Michigan avenue, but for a couple of years it has occupied the old Alco home at Twenty-fifth street and Michigan avenue. Along in 1900-01 Hagmann & Hammerly—both in the automobile justness on the West Side— had the agency for the single-cylinder St. Louis, “the car that runs.” It did, too, and its real successor ls the Dorris of to-day. In 1902 the writer took the agency, giving it up for tho Cameron air-cooled car ln 1903. In 1908 he had the Dorris and the National in 1909, but left the selling branch of the industry in 1910. Way back in the early 90s, the Haynes-Apperson concern held forth on Wabash avenue and the Appersons kept the place open after Haynes and Apperson parted company. The Haynes company sought other quarters and Apperson remained on Wabash for some years, eventually taking a building at 1240 Michigan avenue. In tho meantime the Haynes company, with J. B. Deibler as manager, located on Michigan avenue below Sixteenth street, where it remained until recently. Then the Apperson company went to Thirty-third street and Indiana avenue and is there now. Of the branches these two, with the Locomobile and Winton, are the pioneers. Charles A. Coey, now president of the Coey Motor Company, was the first Chicago agent for the Thomas Flyer. That was in 1902, and his place of business was on Cottage Grove avenue, near Fifty-third street. The business grew so rapidly that he had to be with the others on Michigan avenue. Before he had tho Thomas he dabbled in electric vehicle making for a while. After being in the manufacturing end of the business for some years he organized his present company—when the cyclecar fever broke out—and to-day lt ls capitalised for a million dollars. Mingled with trade interests he was prominent ln automobile racing and aviation,being one of the first to use the balloon hereabouts. Back in 1899— early days in the automobile industry— one can find many young men just out of college working in the Locomobile factory at Newton, Mass. Among these was B. C. Buxton. The next year he was manager for this company in Newport, where he sold many of these little steam cars to the New York four hundred. Later he came to Chicago and was with the Locomobile Company when it made the lease for the first automobile store on Michigan avenue, which was built in 1901 at the corner of Fourteenth street. For the last eight yeaxs Mr. Buxton has had charge of the retail end of the Reo business, which has shown a steady increase from year to year. O. C. Owen, president of the Owen-Buxton Company, distributors of Reo cars, started in the automobile business in January, 1901, in Cleveland with his brother, Ralph R„ selling curved dash Oldsmobile runabouts and operating the first garage in Cleveland. Later he added the Franklin to the line. In the Spring of 1906 he sold his interests in Cleveland. All the participants of the 1906 Glidden tour will remember Owen as the driver of the Olds single-cylinder runabout that made the entire trip from Buffalo to Bretton Woods. In the Fall he came to Chicago as assistant manager of R. M. Owen & Co.’s. branch, which was opened at that time. In the Spring of 1907 he was made manager of the branch, and in the Fall of the same year acquired the business of the branch. Mr. Owen has been successful in surrounding himself with a very efficient selling organization, which has each year, since its inception, increased the sales of the Reo line in the territory controlled by his company. Harry P. Branstetter, the present Kissel distributor, came to Chicago from Wooster, 0., where he had Worked on his father’s farm. Before peaching Chicago he was with his cousin, Barney Oldfield, when the latter was driving Henry Ford’s two racing cars. That was in 1902. He worked for a time in the Winton factory and reached Chicago in March, 1903. He sold two-cylinder Fords and unloaded No. 10 of the Ford output. Later he handled the Mitchell with Mr. Hall, but incorporated the Branstetter Motor Company, handling successively Queen, Dragon and Wayne cars. 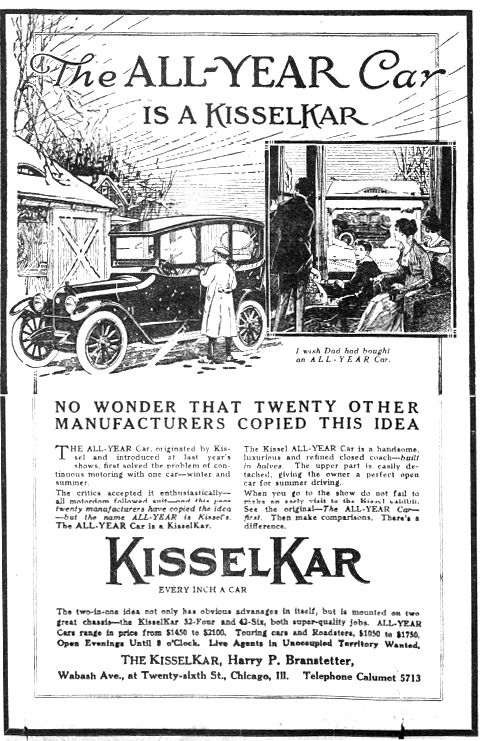 In the Fall oi 1908 he took lip the Kissel, having incorporated the Kissel Motor Company of Illinois and being the manager. Tn 1912 he disposed of his interests, and for a time was the Cole Kansas City manager, but returned to Chicago in 1913 and has since been the Kissel distributor. PAULMAN GOES BACK TO 1900. 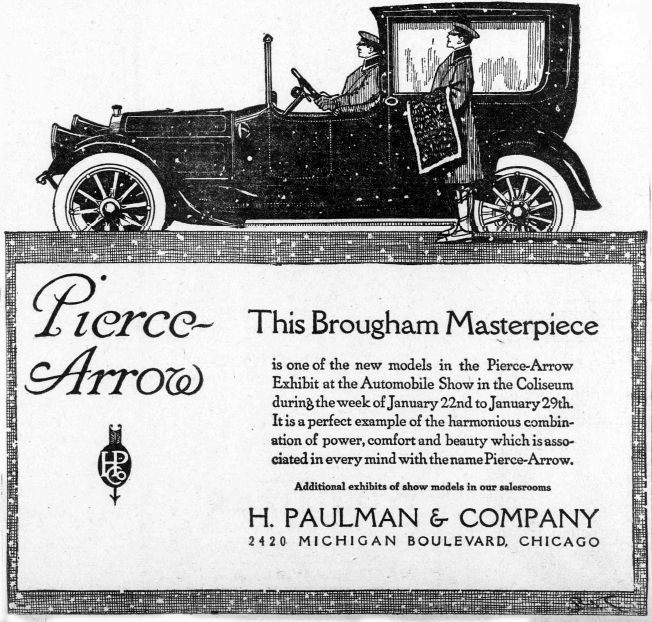 Henry Paulman, Pierce Arrow agent, hasn’t much of an automobile history, except one for success and consistency, for his only account in fourteen years has been the Buffalo made car. From 1892 to 1900 he was with the Link Beit Machinery Com- pany, when he joined Frank Fanning, who brought out an early electric and then an air-cooled car. But Paulman saw possibilities and secured the little Pierce Stanhope and began selling a few to doctors, running a garage at the same time on North State street. He was the second— next to Henry Nyberg—to move to the southern end of the row, and now the majority of the big dealers are there. With Paulman has been associated J. V. Lawrence, who is still vice president of the Paulman Company, and, as well, the Velie agent for Chicago. 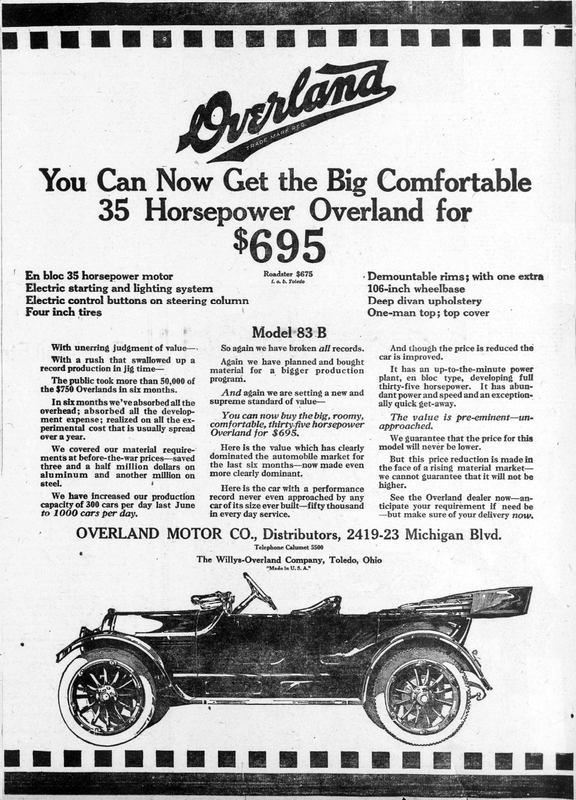 No man in the automobile business has beenmore successful than Charles W. Price, president of the Overland Motor Company, which operates a beautiful salesroom on Michigan avenue and a huge office and service building on Federal street. Price was one of the bicycle brigade, a crack class B man, drifted about somewhat and became a Gothamite. He saw the direction of the wind and in 1905 went and secured just a plain job at the Maxwell Tarrytown plant. He was a road tester and could get as dirty as anybody. Then he wanted to come West— for ho was a Milwaukeean by birth— and kept up his trade with the same company when it had an assembling plant at Grand Crossing, in charge of Wil- liam B.V. Jameson, now at the Newcastle factory. Price was put on a non-motor stop run in the Glidden tour, and later became associated with Wrrd Favorite, who had the Overland, but after a year Favorite became disgusted and quit the business. But Price held on, taking the agency himself, and has had it ever since. Success? Tes, with an underscore under caps. As a matter of fact, Thomas J. Hay. at present Hupmobile and Chandler representative, began the automobile business in the electric days, when the National Company of Indianapolis dabbled in the manufacturing end. He was and is still a stockholder in the National Company and drags down dividends every year. 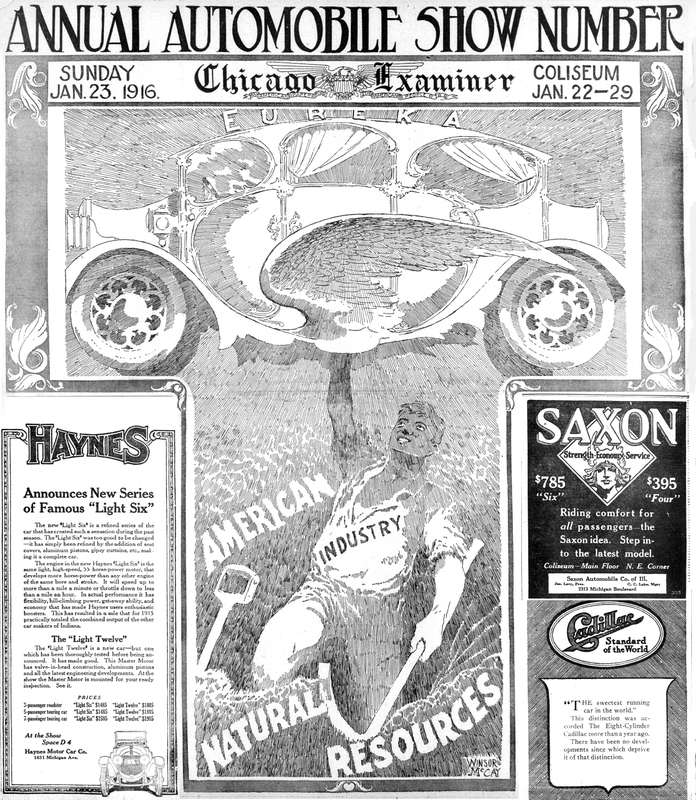 In 1905 Hay came to Chicago and was associated with the late John Hayden, who had the National, which by this time had come to be a gasoline car, and the best one, too, of its day. This was just the time the first little Ford was produced, and Hay opened the Chicago branch for that company, staying there until 1913, his big work-being the construction of the present assembling plant at Thirty-ninth street. Then he started in for himself, with the Staver. A little later on he took on the Hupmobile. and now has the- Chandler with it. His business has been most successful in both lines, so much so that he was compelled to take the entire building at at 2317 Michigan avenue, where he now is. In 1896 J. V. Lawrence started In the bicycle business In Marysvllle, 0., wherever that is. After two years he traveled for the American Bicycle Company in the Winter and worked in the automobile business ln Lima, 0., in the Summer. During 1900 and 1901 he was serving the Pope company ln the Winter and was with the Ralph Temple-Austrian company on Wabash avenue In the Summer. In 1903 Lawrence joined Henry Paulman and has been a Pierce-Arrow man ever since. It ls said of Lawrence that he used to make an offiice-to-office canvass of doctors, hoping to land one once in a while for a Pierce stanhope— and did land three the first year. In August, 1915, Lawrence took over the Velie account and is now pushing that line in Chicago. William J. Mead, branch manager of the Chevrolet Motor Company, was manager of the Monarch Cycle Manufacturing Company, grew into the American Bicycle Company and entered the automobile business with the Buick in the Spring of 1905, when nobody wanted the account, but which proved one of the best. That was in the two-cylinder days. In 1907 Mead was made assistant to W. C. Durant, then had of the Buick concern, and was assigned the task of establishing branches. Mead’s ability gave him the management of the Olds works In 1909, where he remained until the Fall of 1913. The next year he worked on a car of his own, but decided not to produce it and became associated with the Chevrolet Motor Company in 1914, opening the Chicago branch and handling much of the Western business because of wide acquaintance in the trade. Recently it became necessary to take larger quarters at 2612 Michigan avenue, owing to the increase in the Chevrolet business. Louis Geyler was an advertising solicitor on a motor paper, but wanted to get into the motor business, and did so in the firm of Geyler & Levy, which took the Autocar agency in 1907 and had a place on Wabaßh avenue. A little later Geyler pulled out of the firm, took over the Stevens Dyryea and moved to Michigan avenue. In 1911 he secured the Hudson agency, incorporated a big company, saw business grow so rapidly that he was forced to take the old Peerless Building at Twenty-fifth street, and set about building up an organization second to none on the street, and with a record in the way of output. BIRD AND SYKES GO UP. Even if George H. Bird is ahead of B. C. Sykes in the name of the Bird-Sykes Company, Paige distributors, Sykes antedates his business associate in the automobile business in Chicago, for he was with the Locomobile company ln 1902 and stayed there until 1905. Bira was a small bicycle maker on the South Side and went in with Arthur Bennett, opening a store on Lake street and handling the air-cooled Premier in 1903 and 1904. They also had the Mitchell and Glide. In 1905-6 they moved to 1406 Michigan avenue and a year later to 1470 Michigan avenue, where they remained until 1911, when they moved to 2208 and have just gone across the street to a new and elegstnt home. It was ln 1905 that Sykes took over Bennett’s interests. For a long time the Corbin air and later water cooled car was their leader, with the Lozier as a side line. When they took the Paige they continued the Lozier until the company had financial troubles. So the Paige was made the one and only account and it has proved a most profitable one, particularly the past couple of years. The Introduction of A. M. Robbins to the Chicago automobile life was when he took charge of the Rainier branch at 1725 Michigan avenue in November, 1907. The company failed three years later, and Robbins made arrangements with the Centaur Motor Company of Buffalo to open a branch at the same address. That was ln 1909, and the Oakland car was the line handled. When the Oakland went into the General Motors Company, Robbins secured the Abbott-Detroit ln November, 1910, but in 1913, when the Abbott company had financial troubles, he gave up the account and took the Jeffery, then known as the Rambler. The present headquarters were occupied in January, 1918, and to show the success that has come It may be stated that 250 cars were sold In 1914. over 500 ln 1915, and the contract for 1916 calls for 800 pleasure cars and 100 trucks. You wouldn’t think, to look at C. H. Foster, president of the Cadillac Automobile Company of Illinois, that he was once a draughtsman, a toolmaker, a die-sinker and a master mechanic, bnt that has been his career, and that knowledge proved a valuable asset in the automobile business, particularly ln the early days. But recuperation was rapid, the Cadillac business has flourished since, and to-oay it is housed in one of the largest buildings devoted to automobiles, and the big boss— the same Foster— is approaching the multimillionaire class. But supposing he had stuck to his trade! TOP: Studebaker gold chassis in foreground and Willys-Knoght chassis across from it. BOTTOM: Looking north up the main aisle. Note the pagoda copings and the receptacles filled with cherry blossoms and ferns marking off the exhibits.